If you have an iPhone and you want a smartwatch, your first thought is going to be an Apple Watch. If you own an Android handset, your gut probably tells you to check out watches made by Android vendors. But there’s another option that works with iPhones and Android phones, and it has a bunch of big advantages over anything else on the market. 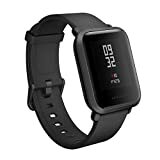 The Amazfit Bip Smartwatch by Huami features a sleek design, heart rate monitoring, sleep tracking, GPS for running, and so much more. It also has a battery that somehow lasts up to 30 days on a single charge. It’s a bargain at its $100 retail price, but you’ll find it on Amazon right now in three different colors for just $75.99. Definitely check it out.